Can evolution and creation both be true or are they both not possible? Evolutionists believe that microevolution and macroevolution are the same thing or work in similar fashion, but microevolution is nothing more than creatures adapting to their environment where birds might have extended beaks to reach certain food sources, but macroevolution would have the bird changing into another species, so you can see how radically different they are. It’s not the same thing to have moths adapt to their specific environment and a moth that evolves into something else. Human beings adapt or change slightly according to their environment, but a bird that grows a slightly longer beak is still a bird and doesn’t change into something altogether different. It’s one thing to have adaptation, but it’s a totally different thing to have species allegedly change into another. The problem with the theory of evolution, besides the obvious problem that it’s a theory is that there is no fossil evidence and missing links are not helpful when the whole change is missing. I know that microevolution has been tested in experiments before but I don’t think “microevolution” is a good name for it because it’s not an evolution but an adaptation. For macroevolution to be true, we should have millions and millions of transitional fossils that show the species morphing or evolving into another…instead, we find species remaining the same species and a fish not turning into a bird or a bird into a lizard, or whatever other theories “propped up” new species. The Apostle Paul spoke about different kinds of species or creatures, saying “God gives it a body as he has chosen, and to each kind of seed its own body” (1st Cor 15:38), and “not all flesh is the same, but there is one kind for humans, another for animals, another for birds, and another for fish” (1st Cor 15:39), so there is only “one kind” for humans, another for animals, and yet another for birds and fish, and these are all different. They do not change into another kind but remain as “one kind” as the Bible says. It cannot be “one kind” evolving into another kind because there is only one kind for animals, birds, and fish. This leaves no room for interpretation but is straightforward in saying that God created one kind after their own kind, and not one kind becoming another. I know it seems to be a stretch, but if you were to ask Jesus if He believed in evolution, what would He say? 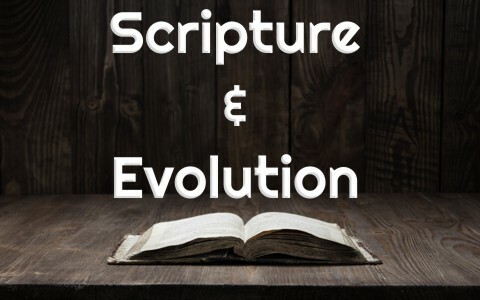 It would seem that the Scriptures cannot allow for evolution since Jesus Himself said “Have you not read that he who created them from the beginning made them male and female” (Matt 19:4). Here is where Jesus says God created them male and female, “from the beginning” and Jesus gives them a slight rebuke, saying “Have you not read” meaning have they not read the Scriptures, particularly the Book of Genesis? God created mankind after His own image and He did not create them into an image that would evolve into His own image (Gen 1:27) and then waited for thousands of years for that to come true. God speaks and things come into existence, not God speaks and then waits for it to become what He intended it to be. Rather, it is just as the Bible says, “Male and female he created them, and he blessed them and named them Man when they were created” (Gen 5:2). Jesus believed in a literal creation of mankind and of the rest of the creation too, so Jesus refers to a literal man and woman in Adam and Eve and not some amoeba changing over millions of years into a male and female. Jesus also believed in the flood of Noah’s day, Jonah being swallowed by a great fish, the Red Sea parting, and the walls of Jericho come crashing down. We can read Genesis and read it literally and not as some analogy of how God used time, chance, and space to create. That’s utter nonsense from a biblical perspective. Richard Dawkins, a staunch anti-creationist and evolutionist has always attacked creationist’s writings about the irreducibility complex problems of life evolving on its own which are major issues for evolution to be true, yet in his book, Climbing Mount Improbable, he writes about probabilities. In fact, he ignores the astronomical odds of life creating itself or arising spontaneously, but he seems fine with using the same outrageous probabilities for life arising by chance. For example, Dawkins debunks creationist’s ideas of the impossibility of naturalistic mechanisms being the way that life could not evolve, but it’s no problem for him to state that the odds-to-infinity claim that over eons of time, this hill-climbing change made life possible by self-evolving creatures, so what sort of duplicity there is in this book and what hypocritical analysis for odds being okay for life evolving on its own while refuting the enormous odds that life could not have possibly evolved on its own, but according to Dawkins own words, “the sort of lucky event we are looking at could be so wildly improbable that the chances of its happening, somewhere in the universe, could be as low as one in a billion billion billion in any one year. If it did happen on only one planet, anywhere in the universe, that planet has to be our planet-because here we are talking about it” (p. 283). [1.] The law of cause and effect provides that the universe could not be self-caused, or could have created itself. Nothing can create itself without an outside cause, at least equal to or greater than itself. To say the universe (and matter) had no cause, caused itself, or has always existed, is essentially saying that all matter existed before it came into existence, which is a logical absurdity. If at any time there was nothing, then nothing exists today, but there was something…or rather, Someone and He is the Creator, so without a universe, and thus matter, the question of life would be a moot point, however Dawkins avoids this impossible question because he has no answer. Aristotle, out of a purely logical conclusion, knew that a “First Cause” was probable and in fact logical. Perhaps Dawkins would be better suited to call his book Climbing Mount Impossible, because the odds he mentioned, “one in a billion billion billion,” are beyond improbable…in fact, they are impossible. I cannot reconcile those who believe in evolution and those who believe in God as Creator. For those who claim to be Christian and still believe in the theory of evolution, how do they explain Jesus referring to a literal Adam and Eve and creating them in His own image? If evolution were true, God would be a deistic God and God would just wind up the universe and let it work itself out, but that’s not the God of the Bible because the Bible says “he spoke, and it came to be; he commanded, and it stood firm” (Psalm 33:9). God doesn’t need to speak and then to wait for millions of years for Adam and Eve to evolve. No, it says, “God created man in his own image, in the image of God he created him; male and female he created them” (Gen 1:27), and not “given enough time and chance” Adam and Eve would be created. God did not create the single-cell amoeba after His own image, but mankind, and Scripture doesn’t allow for an alternative theory. Evolution is a theory….creation is not. More reading on this topic for you: Can Creationism and Evolution Co-exist? Another excellent article sir. I have heard the arguments for the compatibility of evolution with Christianity, but (at least for me) they aren’t convincing. Thank you for another article to make us think. Thank you very much Robert. All glory to God and none to us oh Lord (1 Cor 4:7). Previous post: What Does God Look Like? Next post: What Does Passover Mean To Christians?